The only thing better than a book about food is a book about Italian food, which is why this book had my name on it from the beginning. John F. Mariani put an exhausting amount of research into this book (or at least that is how I imagine it) and basically put together a bible. I learned so much from this book, I am not sure I fully absorbed it all! From food to wine to the imports and exports between the United State in Italy, this book covers it all. For instance, did you know that Italian cookbooks are the fastest selling cookbooks in the United States? Well they are! And from this book I learned just how authentic my family's "Italian"traditions are... which is, like, hardly at all. It is funny just how much the Italians who came from Italy have given to our American nation, though. Many of the foods that we associate as "Italian" cuisine are as American as apple pie... of course, they were invented by Italians, but it's different that you might think. You see, as people came to America from ITaly, there was a new abundance of food for them... like tomatoes, for instance. So, being the inventive type of awesome people that Italians tend to be, we created new cuisine from the available products we had in America, thus, creating a new culture. 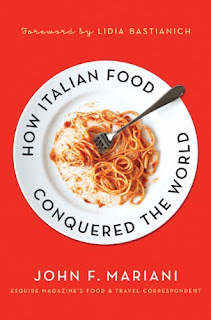 So while you might associate spaghetti and meatballs with the boot of Italy, think again... that's Italian American fusion.... and you can learn all about it in this book! 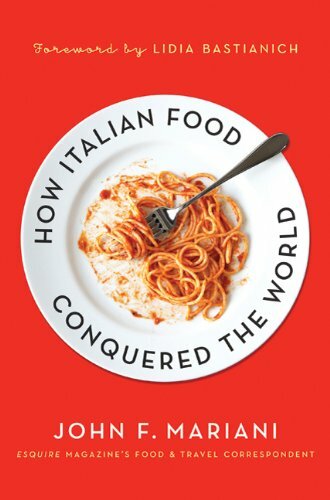 I admit, though, you should have a passion for either Italian-American subculture, or a general love of food if you are going to enjoy this book. For instance, if you mostly read sci-fi or fiction in general, this might not be the book for you. But if are looking for a little culinary adventure and culture this is a GREAT book for you. Full of great stories, wonderful history, and recipes, this book is truly a gem and a must-own for a food enthusiast (or Bossy Italian Wife). The strangest part about reading this book was that by the end of it I had a craving for fettucine alfredo--a food I never craved until I read this! The craving, ironically, has not left yet despite my eating copious amounts of this food, and now it's one of my favorites. Weird, right?